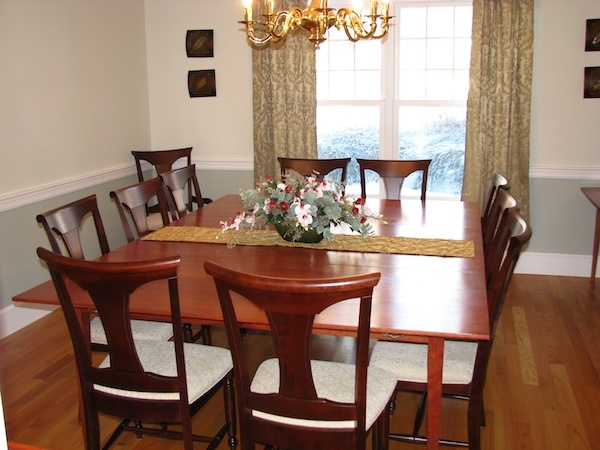 The Boothbay Dining Table adds timeless beauty to to a room where people gather for good food and conversation. This table comes in two configurations. It can be custom made as either a solid table surface or made to expand with two included leaves. Please see Boothbay Dining Table With Leaves page. The legs are removeable to allow for ease in transporting the table. The table top can be made either with square corners or the overall table can have a gentle elliptical curve along all sides (priced separately). Note: other sizes and wood types can be designed. Please inquire.